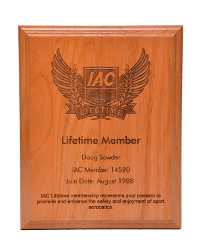 An IAC Lifetime Member becomes part of an exclusive group of people who have chosen to act as stewards of the sport of aerobatics. Lifetime Members lead by example through their demonstrated commitment to promoting and enhancing the safety, education, competition, and enjoyment of aerobatics. Most important, you’ll receive the knowledge and pride that you’re elevating the sport of aerobatics by perpetuating the core values and purpose of the world’s premier aerobatic organization. Become a Lifetime Member today!